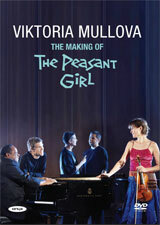 Viktoria Mullova’s rural origins in Ukraine are reflected in the eclectic programme that comprises The Peasant Girl project. Elements of classical music and jazz reflect the phenomenal influence that the gypsies have had on swathes of music in the 20th century. This DVD contains the recording sessions at London’s Abbey Road studios, plus a documentary on the making of the remarkable album, with extensive interviews with Viktoria, Matthew Barley and his ensemble.